Sevenoaks Camera Club is well known in South-East photographic circles. We are members of the Kent County Photographic Association (KCPA) and through them are affiliated to the Photographic Alliance of Great Britain (PAGB). Through these affiliations we have the opportunity to enter competitions and exhibitions at county and national level - sometimes as a Club entry, sometimes as individual members. We have also organised and hosted the KCPA's annual competitions from time to time - including in 2003 when we ran their Ross Cup for prints as part of our 50th anniversary year. We also organised the 2008 Handley Shield and Carter Cup slide competitions for them. Both organisations regularly publish details of people who are willing to visit to judge competitions and give talks, so our membership is a gateway for us to a wider photographic world. Membership of these bodies also makes it easier to link up with other Clubs to arrange friendly competitions with them - which allow us to see even more varied work. And sometimes there are opportunities to attend joint meetings. All of this involvement helps our members see a wider variety of pictures to inspire our own photography. Our own member Patricia Jones was the first lady to hold the position of President of the Kent County Photographic Association, from 2004 to 2006. Patricia and George Jones were made Honorary Life Vice Presidents of the KCPA in 2016 in recognition of their contributions. We have links with a small number of local organisations for different reasons, and are happy to give their web site links here to help build the community. Bat & Ball Station: During 2018 a number of members are photographing the progress on the renovation of this Grade 2 listed station. It was the first station in Sevenoaks, built in 1862, and in taking thes photographs we are supporting the Friends of Bat & Ball Station and the Town Council. Sevenoaks Allotment Holders' Association A very active organisation: we have supported their Autumn Shows. Kentish Opera Some of our members have been photographing this group's productions since 2005 (La Traviata). 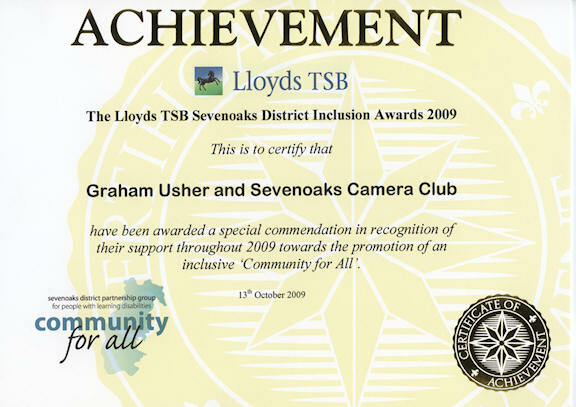 Some of our members, particularly Graham Usher, Jon and Nuala Le Sbirel, and Derek Medhurst have supported the former Sevenoaks District Partnership Group for People with Learning Disabilities, especially by taking photographs at some of their events. We were surprised but delighted in October 2009 to receive recognition for this help.